The Paradox of Our Age, a short but powerful essay credited to the present Dalai Lama, is widely available in Ladakh in northern India, a region known as 'Little Tibet'. The text ends with the observation that: 'These are times of fast foods but slow digestion/Tall men but short characters/Steep profits but shallow relationships/It’s a time when there is much in the window but nothing in the room'. Tibetan Buddhism is widely viewed as an appealing alternative to materialistic Western society, so, not surprisingly, The Paradox of Our Age is widely circulated on the internet and Twitter - see photo tweet below. I bought The Paradox of Our Age on an exquisitely printed little scroll in the Tibetan refugee market in the regional capital of Leh, where I had travelled overland from Delhi in July to observe the Kalachakra teachings given by the Dalai Lama. My accompanying photos capture that intensely moving spiritual event; but they also capture a great spiritual tradition that, as I discovered, has itself become a paradox of our age. Ladakh is in the disputed Indian state of Jammu and Kashmir. It borders on what has been known as the Tibet Autonomous Region of China since the 1949 invasion, and the region is politically sensitive due to its proximity to both China and Pakistan. Ladakh means 'land of high passes' and the region is bordered by the Kunlun mountains to the north and the Himalayas to the south. Summer temperatures exceed 20 degrees celsius, but in the long winter they plummet below minus 20 degrees. There is only one road into Ladakh; this is the notorious Manali to Leh route which reaches 17,400 feet as it crosses the Himalayas and is only open for four months a year. I arrived via this road and photos of my journey can be seen in an earlier post. In 1951 Christmas Humphreys described how in the Himalayas: "The great spaces... and the silence where men are scarce and wildlife is rarer still, all lend themselve to introverted thought, to the practice of the best and worst of the manifold powers of the mind". The Himalayas dominate Ladakh, and the legendary kingdom of Shambhala and the paradise of Shangri-La in James Hilton's 1933 novel Lost Horizon are both, supposedly, located in these mountains. Ladakh was only opened to tourists in 1974; it is an alpine desert with a narrow fertile belt around the course of the Indus river. The area is renown for its stunning scenery and views of the surrounding Himalayas; however, at 11,500 feet visitors are exposed to the risk of altitude sickness, and power cuts are a constant reminder that this is the very edge of the developed world. There are strong historical links to Tibet and 70% of the population are Tibetan Buddhists; but these Buddhists are indigenous Ladakhis, rather than Tibetan diaspora as is the case in Dharamsala. The region is celebrated for its monasteries; there are thirty-six active Tibetan Buddhist monasteries and many smaller ones, however the monasteries are under pressure as a declining birth rate has dramatically reduced the intake of new monks. In July 2014 the Kalachakra teachings were given in the Jiwe-tsal - ‘Peace Garden’ - adjacent to the summer palace of the Dalai Lama five miles outside Leh, and all my photos were taken at this venue. In Ladakh: Land of Magical Monasteries Bob Gibbons and Siân Pritchard-Jones describe how tantric practices came to Tibet from India in medieval times and fused with the occult elements of the indigenous Bönpo religion. Tibetan Buddhism's incorporation of earthy and intense shamanistic elements of the Bönpo religion is often overlooked, but the shamanistic heritage still survives in institutions such as Nechung, the state oracle consulted by the Dalai Lama, and in the numerous fierce protective deities portrayed in the temples. (The Dorje Shugden controversy, which in 1999 resulted in the murder of a senior member of the Dalai Lama's staff and two students, is a dispute about the status of one of these protective deities). In her pioneering book Magic & Mystery in Tibet Alexandra David-Neel describes how Tibetans do not believe in supernatural miracles, but see the exceptional happenings which occidentals consider to be miracles as the work of natural energies. These energies exert their power in exceptional circumstances, or through the skill of an adept who knows how to release them. She also describes how Tibetans believe that anything that one visualises can be realised, because, in their view, if visualised circumstances did not correspond to external reality they would be beyond the power of the imagination. The potential of these natural energies, reputedly, explains the power of the legendary Himalayan masters and yogins. My photo below shows a Tibetan Buddhist protective deity depicted in Hemis Monastery. According to the sutras (scriptures) used in non-tantric Buddhist traditions, the achievement of enlightenment takes many lifetimes. But in Tibetan Buddhism the scriptures used are tantras, and these offer an alternative fast track to fulfillment; this means that by following the tantric path a fully initiated practitioner can achieve enlightenment in a single lifetime. Tantra channels conventional energies into transforming and enlightening energies which transport the adept to higher levels of consciousness. (The very advanced practices involving transforming sexual energy has led to widespread misunderstanding of tantra in the West.) Tibetan Buddhists believe that the Buddha taught the Kalachakra tantra around 2800 years ago to an audience which included the rulers of the elusive kingdom of Shambhala, and the tantra were transmitted to Tibet between the eleventh and fifteenth centuries. Kalachakra means 'wheel of time' and the complex teaching leads practitioners from quotidian time to an alternative temporal realm where the enlightened can fuse with the Kalachakra deity in the legendary kingdom of Shambhala. Mandalas are used in tantric practices as a meditation aid, and the Kalachakra tantra uses visualisation and meditation to guide initiates through a specially constructed sand mandala. 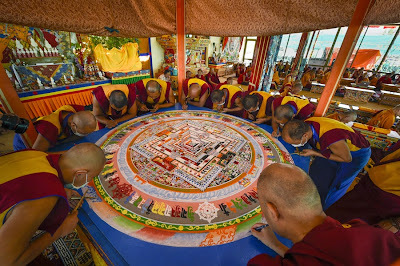 The photo below, which comes via the Dalai Lama's website, shows the Kalachakra sand mandala in the final stages of construction at the teaching ground. Tantric empowerments are usually secret and exclusive rituals, but, uniquely, the Kalachakra is taught in public to large audiences. 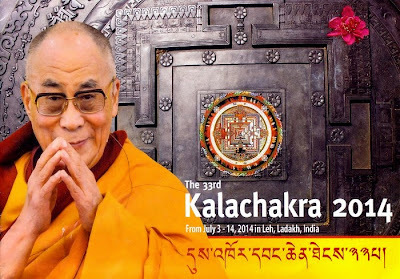 The present Dalai Lama has a particular affinity with the Kalachakra tantra, and the 2014 empowerement was the thirty-third that he has delivered. All but two of these have been given since he was exiled from Tibet, and the initiations have attracted large audiences around the world in high-profile venues, including Madison Square Garden, New York in 1991. In recent years, at the direction of the Dalai Lama who is a Nobel Peace Prize laureate, the empowerment has been promoted as the 'Kalachakra for World Peace'. The audience for the 2014 initiation packed the 37.5 acre peace garden; there were 160,000 devotees, of which 30,000 were monks and 4000 came from outside the Indian sub-continent. Although primarily aimed at Tibetan Buddhists, the Dalai Lama stresses that non-Buddhists can achieve karmic benefits by attending the Kalachakra teachings. The 2014 empowerment was given by the Dalai Lama over six days; with the teachings lasting an uninterrupted four hours each day. All the teachings were in Tibetan, with simultaneous multi-lingual translations on FM radio frequencies. There was no seating other than the ground, and the only refreshments were Tibetan tea and dry bread, and temperature hovered around 30 degree celsius for all six days with very intense sun due to the extreme altitude. With a limited number of squat toilets available, enlightenment may come quickly at the Kalachakra, but it does not come easily. Monks were, quite understandably, given the prime positions in the peace garden complete with their own toilets; the other 120,000 people in the audience watched on giant LED TV screens and listened either to the Tibetan text over the PA or to translations on FM radios. The size of the crowd and distance from the action made the event seem like a giant rock concert without the music. I was one of the privileged few with a press pass, and this allowed me to take the photos of the Dalai Lama seen here; but for most of the audience he was no more than an image on an LED screen for the twenty-four hours of teachings. Ladakh is politically volatile, and the 1999 Kargil War in the region between India and Pakistan threatened to escalate into a full-scale nuclear conflict. In additions to the tensions with Pakistan, there were concerns about threats to the Dalai Lama from extremist Chinese groups. So, there was an armed military presence at the 'Kalachakra for World Peace', and His Holiness' heavyweight bodyguards can be seen in my header photo. Attending the Kalachakra teachings emphasised how deeply rooted Tibetan Buddhism is in this part of the world. In her definitive study Ancient Futures: Learning from Ladakh Helena Norberg-Hodge describes how at the 1976 Kalachakra in Leh: "...There was almost a carnival atmosphere. One minute the man in front of me was lost in reverence, his gaze locked on the Dalai Lama; the next minute he would be somewhere else, spinning his prayer wheel almost absentmindedly". This combination of devotion and carnival, which is unique to Eastern spirituality, also dominated the 2014 teachings and can be seen in my photos. As a minority occidental I felt as though I was not so much a participant in the empowerment as a privileged outsider who was intruding in order to catch a glimpse of something both alien and wonderful. The four thousand foreigners attending the teachings came from seventy-three countries, which is a reminder that Tibetan Buddhism has wide but shallow roots in the West. These wide but shallow roots reflect the paradoxical relationship that the Dalai Lama has with the West. 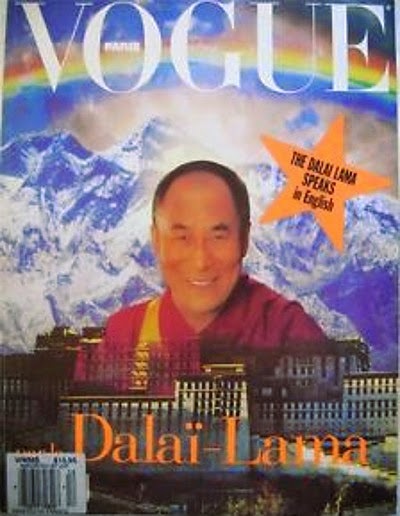 In a 2006 interview he stated "I don't want to convert people to Buddhism - all major religions, when understood properly, have the same potential for good" yet he maintains a consistently high profile in the Western media that cannot be explained simply by the need to ensure that the Chinese occupation of Tibet is not forgotten. His Holiness' very slick Twitter feed has attracted 9.2 million followers, causing The Daily Beast to hail him as a "Twitter rock star", while in 1992 he guest edited the Christmas edition of Vogue - see below. This love affair with Western media is strangely at variance with the concept of ego-death - anatta - which is central to Buddhism, and the Dalai Lama is not averse to using egocentric show business personalities such as Russel Brand to front his appearances in the West. At least we were spared the despicable Brand in Ladakh; instead the headline Western celebrity was the infinitely more enlightened if over-exposed Richard Gere, as seen in my photo. 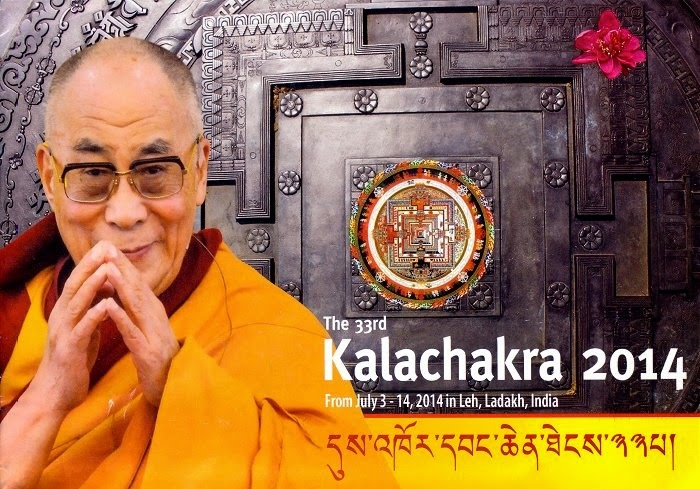 In a media interview the Dalai Lama declared that 'Westerners are too self-absorbed', so it is unfortunate that the official promotional material for the Kalachakra teachings seen below resembled a poster promoting the latest album from an ageing rock star. This paradoxical preoccupation with self has also been evident in previous Dalai Lamas. The spiritual leader of all Tibetans is revered as the reincarnation of Avalokiteshvara Bodhisattva, the transcedent Buddha of infinite compassion. (Om mani padme hum is the celebrated mantra of the Buddha of compassion). But the role of reincarnation of the Buddha of compassion was, in fact, self-bestowed by the fifth Dalai Lama who, around 1650, was looking to beef-up his spiritual CV. A preoccupation with self is also found in those who surround His Holiness. Selfies have become the default tool of 21st century tantric visualisation, and so much time is spent on Facebook by some prominent rinpoches (abbots of monasteries) that it is difficult to see how they have time to fulfill their liturgical duties. During downtime at the Kalachakra teachings the talk among Western practitioners was not of how the sangha should react to the escalating Syrian humanitarian crisis, but of who would be granted an audience with His Holiness, and whether there would be a photo opportunity with 'Richard' (Gere). In India guru bhakti - adoration of the teacher - is a recognised condition, and in Ladakh there were many Westerners following enthusiastically in the footsteps of Madame Blavatsky, Annie Besant and Mary Lutyens. One of the flimsy justifications used by the Chinese for the invasion of Tibet was that pre-1950 Tibet was a feudal theocracy, and, it has to be said, there are traces of this alleged feudal theocracy in Ladakh. Tourism is now the main industry of the region, and the monasteries, which have major land holdings, are involved not only as tourist destinations, but also as infrastructure providers. Our hotel in Ladakh was wholly owned and manged by one of the largest monasteries, and, also under the control of the monastery, was a new 'glamping' (glamour camping) site. 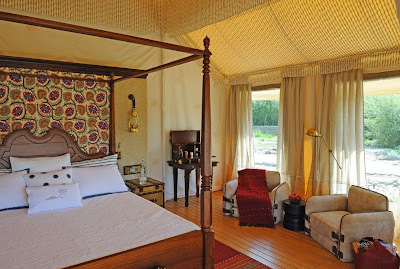 This offers accomodation in luxurious tents complete with four poster bed and 24/7 personal butler at a cost of £3428 per person for nine nights including flights from London. This glamping venture has, reportedly, some rather opaque connections with the Indian army, and the rumour in Leh was that some traditionalist monks and local people were not too happy about it. A cliché ridden folklore display was provided by our monastery owned hotel, while the pioneering ecology centre created by Helena Norberg-Hodge to help preserve the culture of Ladakh is now just a dusty relic. Although the wonders of the mountains and monasteries can never be overshadowed, there is a real risk that the area around Leh will soon become a giant Tibetan Buddhism theme park. Ironically the Gelug sect of Tibetan Buddhism, of which the Dalai Lama is the leader, started as a reformist movement aimed at restoring the purity of the Buddha’s teachings. Perhaps the time has come for the reformists to be reformed? The PR photo below shows the interior of one of the monastery 'glamping' tents. 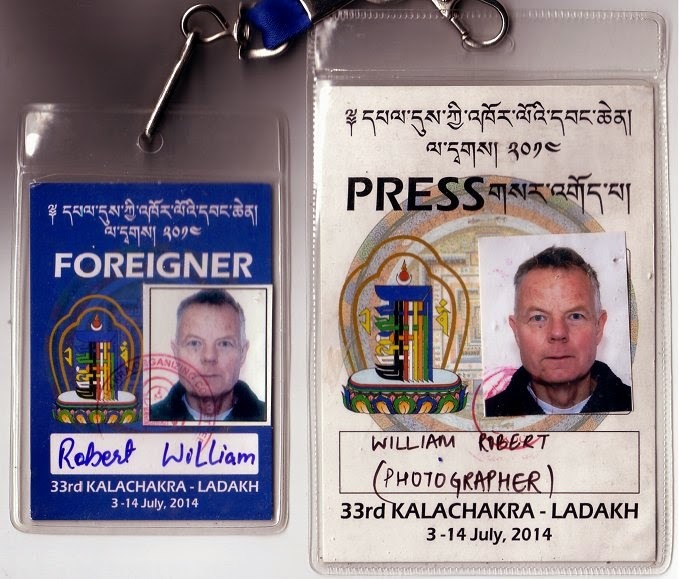 Tibetan Buddhism's paradoxical relationship with the West is reflected in the way the Dalai Lama assiduously courts the Western media, but is then remarkably naïve when dealing with it. His denouncement of the Dorje Shugden practice, although doubtless based on genuine religious convictions, was a significant PR own goal. While his views on homosexuality, again doubtless steered by conviction, are not exactly nuanced: I quote verbatim from a Telegraph interview: "Using the other two holes is wrong". That interview was given in 2006, and six years later the Telegraph was reporting, somewhat perplexingly, that His Holiness supports gay marriage. The quality of impermanence - anicca - is central to Buddhism, and it can be found in a number of the Dalai Lama's viewpoints. For instance, he is a Nobel Peace Prize laureate, and, as recounted earlier, the teachings in Ladakh were billed as 'Kalachakra for World Peace'. Which contrasts with His Holiness' close historic links with the CIA. In the 1960s the Tibetan government in exile received $1.7 million a year from the CIA; the Dalai Lama was a beneficiary of the CIA funding , reportedly receiving $15,000 a month from the late 1950s until 1974. Official US government documents confirm the reports and record that the funding was to support "political action, propaganda, paramilitary [my italics] and intelligence operations". But this alliance between the CIA and Tibet's spiritual leader was impermanent, and in his 1991 autobiography the Dalai Lama distanced himself from it, blaming the Americans for cynical exploitation of the Tibetan cause. There is also a paradox in the tantra used for the 'Kalachakra for World Peace'. As Donald Lopez points out in his refreshingly sceptical Prisoners of Shangri-La: Tibetan Buddhism and the West, the Kalachakra tells how in the year 2425, the army of the king will sweep out of Shambhala and defeat the barbarians. This Buddhist Armageddon, which legend tells will restore Buddhism to India and the world and usher in a reign of peace, has disturbing similarities to the Chinese invasion of Tibet almost exactly a century before. Many followers of the Dalai Lama, and some close to him, defend this CIA involvement with the argument that His Holiness knew nothing about it; this despite documents clearly showing that the alliance was masterminded by the Dalai Lama's brother Gyalo Thondup. This dalliance with the CIA may not be recent history, but the perplexing paradoxes remain. All too often in Ladakh when I raised the controversies over the Dalai Lama's views on important topics such as homosexuality, I was given one of two less than convincing explanations: either His Holiness' views had been mistranslated (this despite the 2006 Telegraph interview in which he expressed his views on homosexuality being given in English, a language the Dalai Lama speaks reasonably fluently, with an interpreter on hand), or he had been badly advised by his private office. Sadly, this auspicious impermanence also applies to the The Paradox of Our Age essay. As recounted earlier, I am one of many whose attention was caught by this engaging little homily. But when I returned from Ladakh, my researches show with considerable certainty that not only was the text not written by the Dalai Lama or anyone in his private office, but it was not even written by a Tibetan Buddhist. It was, apparently, written by Dr Bob Moorehead, a former Christian pastor from Seattle and appeared in an essay under the title The Paradox of Our Age in Words Aptly Spoken, a 1995 collection compiled from his sermons and radio broadcasts. The version attributed to His Holiness is a robust precis, the original text can be read here and compared with the 'Dalai Lama' version here. I have no evidence at all that the Dalai Lama or those close to him are involved in the misattribution, and a comment on an internet forum says "I seem to recall something from the Private Office of His Holiness that it was NOT the work of His Holiness". 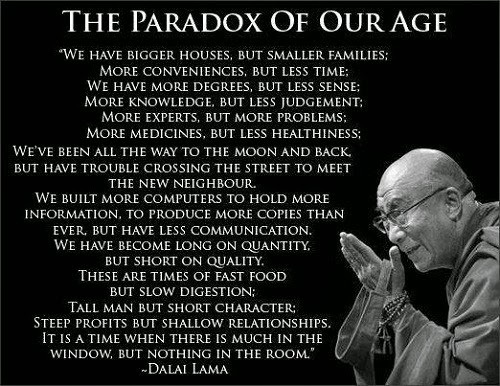 Which, however, rather begs the question as to why monasteries close to the Dalai Lama are selling The Paradox of Our Age in a version credited to His Holiness. As Swami Vivekanada told us: "God comes to earth to found a religion and everything is very beautiful, but the Devil comes right behind him and organises it". How unbelievably modest are human beings who bind themselves to only one religion! I have very many religions,and the one overriding them is only forming throughout my life. All photos, unless otherwise noted, are (c) On An Overgrown Path 2014. Any other copyrighted material is included as "fair use", for the purpose of critical analysis only, and will be removed at the request of copyright owner(s). Also on Facebook and Twitter. This post and the photos are terrific. Coming up against some of these issues myself from time to time, often think 1) life is tough in samsara with all its misapprehensions on all sides, and 2) there's a tendency to project what we want them to be on those in the red robes. That Swami Vivekananda goes to the heart of the matter. I'm going to run "the fifth Dalai Lama who, around 1650, was looking to beef-up his spiritual CV" by a lama friend to see what he says - I'll be surprised if he doesn't have a different characterization of that - but knowing for sure what was going on in 1650 seems a long shot. Dorje Shugden practicioners. (The second source above falls into the latter category, although it does contain very relevant facts). But, as I said in the post, although doubtless based on genuine religious convictions, his denouncement of the Dorje Shugden practice was a significant PR own goal. Admission to the 2014 Kalachakra in Leh was completely free, and the organisers undoubtedly incurred considerable costs presenting it. But the ticket costs for the Dalai Lama's current teachings in Hamburg, Germany are quite an eye-opener. The Hamburg organisers clearly state that the event "is non-commercial and functions only to cover costs". But the top ticket price for a single day of the four day teachings in the 12,500 seater hamburg Congress Centre is 131 euros (174 US dollars, 105 UK pounds). Which does make Lady Gaga tickets seem a bargain. The Dalai Lama's teachings may well be non-commercial and functioning only to cover costs. But the second source in the comment above reports His Holiness as staying in the presidential suite at the 5 star Steigenberger Frankfurter Hof hotel on a previous visit to Germany, accommodation that reportedly can cost $3000 a night. Is this really sending the right message? Good work. Well done for pursuing the Paradox to source.